Info "Hit the white ball with the cue stick to sink at least one ball." Pool Boy is one of Ashley's Microgames in WarioWare: Smooth Moves. The name of this microgame is a play on "pool boy", a boy who serves people at a swimming pool. 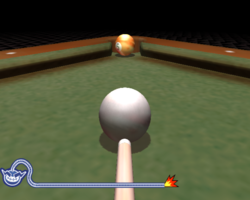 The player has to sink balls with the cue ball. To do this the cue ball has to hit any other ball, and that ball will have to sink. If the cue ball sinks, then the player loses. 1st level difficulty: One ball right next to the hole. 2nd level difficulty: Two balls on the table. 3rd level difficulty: Several balls on the table. It may be necessary to ricochet the cue ball. This page was last edited on February 20, 2018, at 01:02.